Double Header 19th Century Baseball Game at Ringwood Manor - May 1, 2016 ~ The History Girl! Batter up! On Sunday, 19th century baseball returns to Ringwood Manor, and this year, it's a double header between two historic New Jersey teams! The Hoboken Nine and the Flemington Neshanocks will be facing off with one another, with the first pitch being tossed out for games beginning at 11:00 am and 2:00 pm. A local fan favorite event, baseball enthusiasts both young and old are encouraged to come see Americas favorite pastime played according to 1873 rules and regulations. 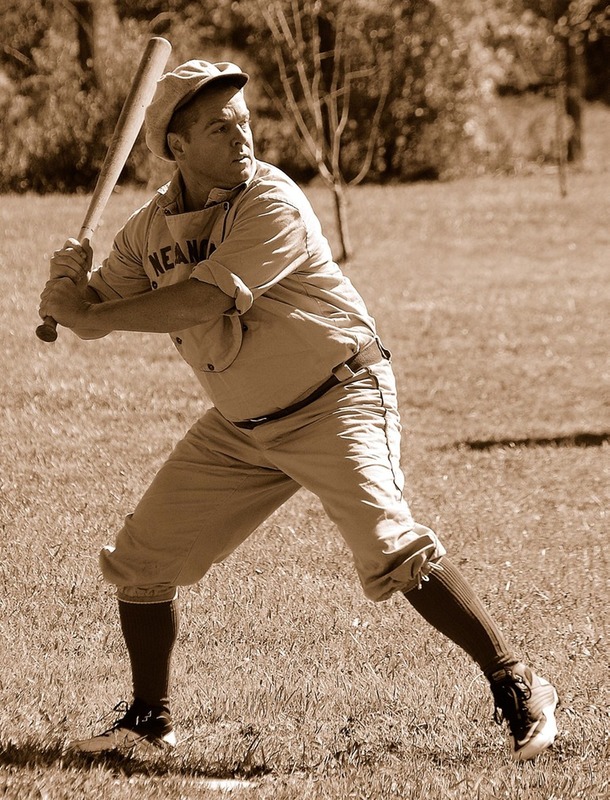 The teams play following the rules and customs of the time, use period baseball equipment, wear typical 19th century baseball uniforms, and even use language and phrases of the era! During the 7th inning stretch, hear a retelling of the classic baseball poem, Casey at the Bat. Bring your chair, a blanket, your picnic lunch, and cheer on your favorite team. The public is invited to come see how the game of baseball has evolved and changed over 125 years! The Hoboken Nine and Flemington Neshanocks are both non-profit organizations whose missions are to preserve, perpetuate, and promote the game of baseball as it was played during its formative years in the nineteenth century. They demonstrate the historic origins of our national pastime all over the tri-state area using high standards of historical accuracy and authenticity based on lengthy research. But most of all, they want people to enjoy the origins of the sport as much as they do! In addition to the outstanding athleticism and sportsmanship on the field, the teams and their personnel will show how the rules of the sport evolved and how they differ from today. You will see that all fielders do not use gloves. Instead, they play barehanded just players did in 1873! Did you know that originally fielders were allowed to soak or throw the ball at a base runner in hopes of scoring an out? The teams are always looking for new ballists, muffins, Grant Men, Greeley Men, and bugs to enjoy the game the way it was meant to be played. Never heard of those terms? Do you have questions about the history of the game? Want to try the equipment yourself? Come to the game and find out what all these historic nicknames mean and speak to the players! The teams welcome questions from the public and enjoy engaging with fans all ages and knowledge levels. The games will be played in the open field located next to parking lot B at Ringwood Manor. There is no fee to enter the park or for the event. Please be aware that the field has no bleachers for the public. Those coming to visit are advised to bring their own chairs or a blanket to sit on. Picnic tables in the area are available on a first-come, first-serve basis. Light refreshments and hot dogs will be available to purchase at the field starting at noon. Heavy rain will cancel the event. Want to take a time out from the games? Historic Ringwood Manor will be open for guided, timed tours between 10:00 am and 3:00 pm. Tours are approximately 1 hour and 15 minutes long and take visitors through 30 of the 51 rooms in the manor. Tickets can be purchased at the park office and are $3 for adults, $1 for children ages 6-12, and free for children 5 and under. This event is sponsored by Ringwood State Park staff and the North Jersey Highlands Historical Society. 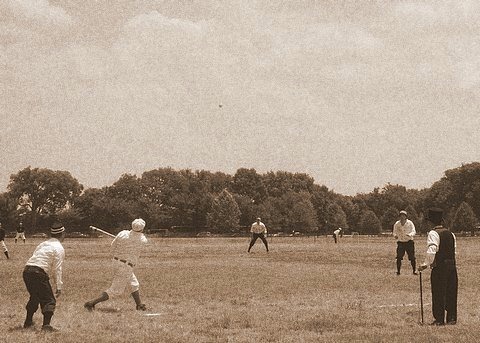 If you would like more information on the history of 19th century baseball, visit the Vintage Baseball Association website at www.vbba.org. If you want to find out more about the teams, their players and umpire, or would like to join their club, please visit http://hobokennine.jimdo.com and www.neshanock.org. Ringwood Manor is located at 1304 Sloatsburg Road, Ringwood, NJ, within Ringwood State Park. For more information, call 973-962-2240 or visit www.ringwoodmanor.org.